Apollo’s Hegemony Phenibut is a preparation, in the composition of which there is phenibut - a substance which is a phenyl derivative of γ-aminobutyric acid with a calming effect, improving well-being and sleep and alleviating the feeling of anxiety and social alienation. Phenibut (beta-phenyl-gamma-aminobutyric acid) is a phenyl derivative of GABA (γ-aminobutyric acid) - the main endogenous neurotransmitter and neuromodulator of the central nervous system. Phenibut finds wide application as an anti-stress, anti-anxiety and analgesic agent and it also supports therapy of addiction to alcohol and psychoactive substances. Phenibut was discovered and introduced to clinical practice in 1963 in Russia, where it has been widely used in order to fight nervous tension, fear and anxiety among neurological patients. GABA applied orally, however, is not able to cross blood-brain barrier, as it undergoes enzymatic breakdown in the nervous system. Phenibut, contrary to GABA easily crosses this barrier and incredibly effectively increases the level of GABA in the brain, which it owes to the presence of a phenyl grouping. Therefore, its activity is very quickly sensible by the organism, which makes it a perfect alternative to supplements with GABA. GABA, as a neurotransmitter with an inhibiting effect in the central nervous system demonstrates a “quietening” effect, i.e. it has anti-anxiety, anti-stress, calming and relaxing properties and it also contributes to improving sleep quality. Its deficiency is related to anxiety, sleeplessness, depression and mood deterioration. GABA demonstrates its activity by means of specific receptors - GABAB and GABAA. Due to the fact that Phenibut is structurally similar to GABA, it plays the function of the antagonist of GABAB receptor (similarly to baclofen or GHB) and in larger amounts also of GABA, therefore it influences GABAergic system, demonstrating the above mentioned quietening effect. By optimizing the level of GABA in the brain, Phenibut introduces the organism in the state of peace, relax and release from stress. Phenibut is a great product, which facilitates maintaining the state of deep relax and calm. By reducing the level of stress and tension and by relaxing muscles, it positively influences the process of falling asleep, enabling healthy and deep sleep, which in turn positively influences attitude to the next day. Phenibut also demonstrates gentle dopaminergic effect. Dopamine is a neurotransmitter, which is responsible for the level of stimulation of the organism, the feeling of pleasure and euphoria and it also coordinates muscle work. Excessively high level of dopamine may be the cause of excessive stimulation of the nervous system, however, Phenibut counteracts this, thanks to which it influences the improvement of mood and the increase of motivation to act, without negative consequences. This substance is also attributed neuroprotective effect. 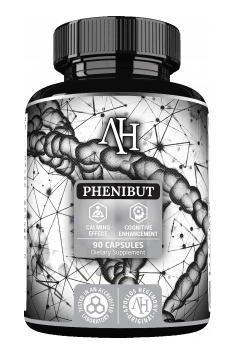 Phenibut counteracts degenerative lesions and stabilizes blood flow in the nervous system and it also normalizes metabolism of brain tissue, at the same time contributing to the improvement of the functioning of the brain. It is therefore also used in order to improve cognitive functions. Phenibut may increase the production of the growth hormone, which promotes the development of muscles, supports the breakdown of fatty tissue and facilitates regeneration of the organism. Therefore, Phenibut is a product that sportsmen, who take care of shaping sports silhouette often reach for. To sum up, Apollo’s Hegemony Phenibut is a perfect solution which helps to fight with stress and anxiety related to the spate of daily chores. It helps to achieve inner peace, therefore, it is recommended in the period of intensive physical and intellectual effort to people, who have problems with dealing with daily challenges and accompanying anxiety and stress. Thanks to its relaxing effect and properties improving regeneration and helping in shaping the body, it is also recommended to sportsmen. Capsule version: Take 1 capsule to two times a day. To promote restful sleep, consume 1-2 capsules before bed. Start at the lower dose to assess tolerance. Do not take for more than 3 days in a row without a 2-3 day wash out. Use only as directed. Do not exceed recommended daily intake. Powder version: The recommended dosage is between 250 mg to 1000 mg per day. It is advised, however, to start with a smaller dose and give your organism time to adjust before increasing to the full amount. In order to achieve gentle mood improvement and the feeling of peace, the lowest dose is recommended, taken 2-3 times a day. In case of the higher dose used 2 times a day, we may also expect the improvement of well-being and calm along with the improvement of sociability and falling asleep easier. However, regardless of the goal we want to achieve, it is recommended to start supplementation from the lowest dose and check how the preparation works for us, as the effect may be more or less intensive, depending on the organism. Phenibut should be used only on ad hoc basis. In order to avoid developing tolerance or rebound phenomenon, do not use the product too often (up to 2-3 times a week). Microcrystalline cellulose, Rice flour, Capsule shell. A preparation containing methylated vitamin B12 with high bioavailability, in vegan capsules. Phenibut (β-phenyl-γ-aminobutyric acid) - a chemical compound which is a derivative of two substances with important influence on psychological state of a human being: gamma-aminobutyric acid and phenylethylamine. It demonstrates a calming effect, facilitates relaxation and is recommended in the therapy of anxiety states. At the same time, it does not cause deterioration of sensorimotor abilities and does not increase the level of sleepiness, enabling normal functioning (however, it needs to be highlighted that there are no reliable sources regarding the influence of Phenibut on the ability to drive vehicles). Some sources also say that Phenibut is able to increase the level of dopamine. Therefore, β-phenyl-γ-aminobutyric acid may increase the level of motivation and willingness to act. The organism of a human being can quickly develop tolerance to Phenibut, therefore it is not suitable for constant supplementation. It is effective only as a temporary measure - its activity is much weaker as early as in the second day of application.